A roost is a structure that bats use for shelter. In summer, groups of adult females roost together in maternity colonies to give birth and raise their young. Maternity roosts must be warm to promote growth of the young bat pups, which is why buildings and attics are popular roost sites for species such as the little brown bat. Locating maternity roost sites is an important first step toward monitoring summer bat populations. Once a roost has been located, bats can be counted as they emerge in the evening to go forage. In response to the recent arrival of White-nose Syndrome (WNS) to Washington, the Alaska Center for Conservation Science initiated a bat maternity roost monitoring program during the summer of 2016. See below for information on how you can help. 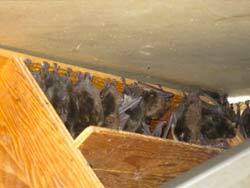 If you have a roost in your building that has become a nuisance, see Living With Bats. Report a roost: If you know the location of a bat roost that is regularly used by more than one bat, please complete the online Bat Report Form. Monitor a roost: Help document maternity colony size and timing of reproduction by volunteering to count bats as they emerge from their roost in the evening. Please visit the Alaska Center for Conservation Science for forms and more information. Bat house: To report bat use of a bat house, please complete the online Bat Report Form. Learn more about bat houses at Bat Conservation International.